Londoners are being asked to help the city's young homeless on a leading charity's 35th anniversary. Centrepoint, which has 16 hostels in London, needs to raise more than £200,000 in the next 10 days to accommodate 600 people over Christmas. To reach the target, the Countdown to Christmas Appeal needs to raise a further £4,000 per day. The first Centrepoint shelter was set up on 16 December 1969 in the basement of a Soho church, in central London. Chief executive of Centrepoint Anthony Lawton said he was "confident" the charity would reach its target. 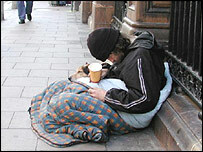 He said: "There are too many homeless people but in particular there are too many homeless young people. "All of them, one way or another, are on a downward spiral and what we are doing is helping them build some foundations. "Christmas is a time when it's particularly poignant for people, if they haven't got a home, or they've got problems about relationships with home, and it's a time when it looks as though other people have got a home, so it's particularly poignant." Donations can be made via the charity's website.